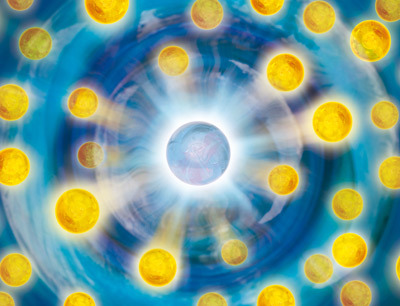 Physicists at the University of Innsbruck have succeeded for the first time in experimentally realizing a new quasiparticle, a repulsive polaron, in an ultracold quantum gas consisting of lithium and potassium atoms in a vacuum chamber. Ultracold quantum gases are an ideal experimental model system to simulate physical phenomena in condensed matter. In these gases, many-body states can be realized under highly controlled conditions and interactions between particles are highly tuneable. A research group led by Wittgenstein awardee Rudolf Grimm and START awardee Florian Schreck have now realized and comprehensively analyzed repulsive polarons for the first time. The scientists from the Institute of Quantum Optics and Quantum Information (IQOQI) of the Austrian Academy of Sciences and the Institute for Experimental Physics of the University of Innsbruck are international leaders in this field of research. To realize repulsive polarons experimentally, Rudolf Grimm and his research team produce an ultracold quantum gas consisting of lithium and potassium atoms in a vacuum chamber. They control particle interaction with electromagnetic fields, and by applying radio-frequency pulses they then drive the potassium atoms into a state where they repulse the surrounding lithium atoms. This complex state can be described physically as quasiparticle because, in various ways, it behaves like a new particle with modified properties. By analyzing the whole energy spectrum of the system, the researchers were able to demonstrate repulsive polarons. “This way we were able to realize and analyze not only attractive but also repulsive polarons,” says Prof Grimm. While attractive polarons have been studied before, the quantum physicist and his team have entered a completely new scientific field with these novel repulsive quasiparticles. The scientists have published their results in the journal Nature. The experiment was carried out in close cooperation with two theoretical physicists from Denmark and Spain and is financially supported by the Austrian Science Fund (FWF) within the Special Research Program FoQuS. Be the first to comment on "Physicists Realize New Quasiparticle in Ultracold Quantum Gas"